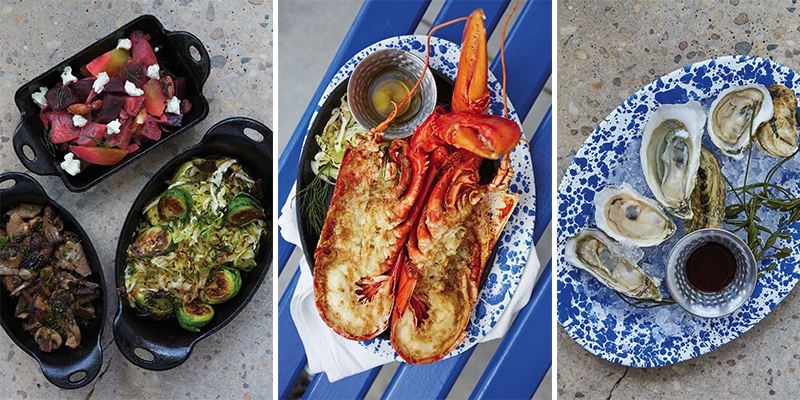 PHOTO: (left) Blue-and-white enamel plates and cast-iron cookware frame NICO’s offerings, including (clockwise from top left) roasted Brussels sprouts and shallots, a shrimp and periwinkle snail starter, and baked clams in a bacon broth. (right) Chef Nico Romo serves up seafood dishes prepared in classic French style. “Allez! Allez!” reads the back of a server’s shirt as he whisks by tables to deliver sizzling cast-iron dishes still piping hot from the wood-fired oven at NICO. The slogan is half imperative, half cheer—“Go! Go!”—a rallying cry for a restaurant whose youthful energy is palpable. 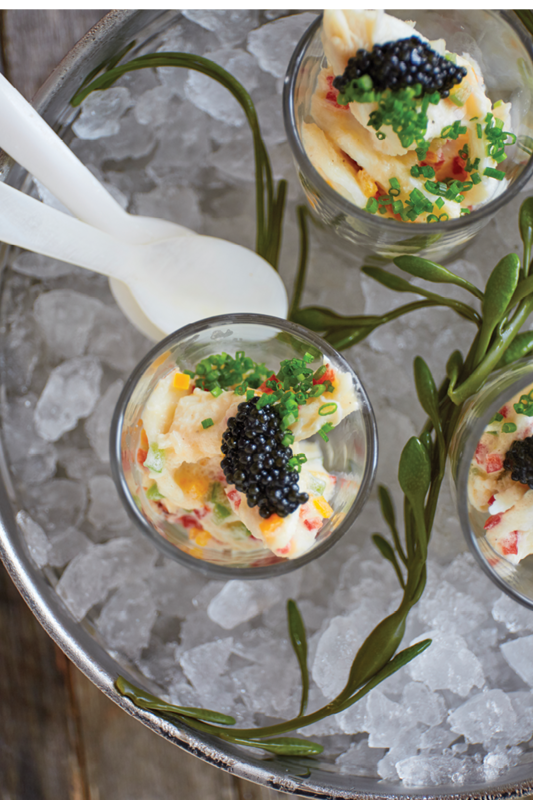 PHOTO: Lush Hour - Pair a cocktail with this rich starter of crab meat mixed with crème fraîche and topped with caviar. Clearly, oysters are front and center at NICO, the eponymous eatery of French-born executive chef Nico Romo, who traded in his decade-long reign at Fish Restaurant on King to launch a much more personal venture near the working docks on Shem Creek. Romo has the enviable distinction of being the youngest chef ever inducted into the exclusive legion of Master French Chefs in America, a small group currently totaling 75 that is dedicated to preserving French culinary traditions and techniques. And yet, NICO doesn’t hit us over the head with France. In fact, the building itself is as American as apple pie: a former Pizza Hut whose inverse trapezoidal windows make for surprisingly stylish, modern accents framed with whitewashed brick. Francophiles will appreciate playful allusions to the country’s tricolor flag, its blue, white, and red cleverly worked into NICO’s logo. The same colors imbue paint covering traditional Charleston benches on the open patio, where guests mingle for weekday happy hour’s $5 drinks and $1.50 oysters. Along with the striped “Allez!” shirts, servers don denim Breton skull caps (for sale if you want to unleash your inner French sailor). NICO is as much a love letter to Romo’s Lyon roots as it is to his Lowcountry home. Take, for example, the French onion soup: Guests will either like it or hate it for its sheer creativity. Described aptly by a server as the marriage between French onion and she-crab soup, the broth is unexpectedly creamy, briny (it uses seafood stock), and spiked with sweet Pernod (i.e., French absinthe). Floating on top are miniature, sea-inspired Croque-Monsieurs—melted emmental cheese oozing over fresh lump crab meat on toasted baguette wedges. It took me a few bites to overcome my previous onion soup affiliations and embrace NICO’s novel twist on a classic, but boy did I. 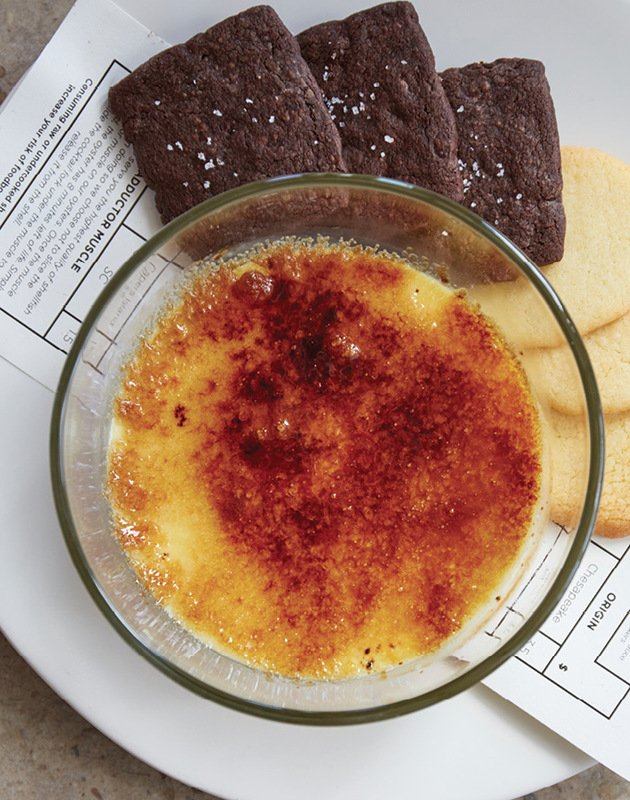 PHOTO: Crème brûlée is served with housemade cookies. Shrimp cocktail makes a great choice if you’re here strictly for drinks and appetizers. Its presentation alone is worth the price of admission. A miniature Eiffel Tower of meaty, tail-on shrimp, faintly smoked in the wood oven and richly hued with espelette (a naturally smoky-sweet Basque pepper) graces a mound of ice bookended by ornate shells. The shells frame ramekins of fiery cocktail sauce and an aioli infused with both Cognac and Dijon mustard, all nestled in NICO’s signature blue-and-white enamelware. It’s a show-stopper, much like NICO’s other shellfish platters, with their cobalt vials containing droppers of fresh lemon juice and ancho chile paste with a tobacco-like kick. At NICO, you can either go light or all in. A leaner meal might entail a shot glass of chilled crab swirled with crème fraiche, dotted with bright peppers, and topped with hackleback caviar—a refreshing appetizer. You could round that out with raw oysters, a salad, and a chilled glass of rosé from southern France. A more indulgent, rib-sticking approach would be to go for shrimp and periwinkles (sea snails) swimming in a cast-iron skillet of bubbling mashed garlic, herbs, and butter. Or the exotic quenelle, which is essentially a sous-vide seafood mousse slathered with crawfish sauce. Or my personal favorite, local clams that come with baguette slices to mop up their bacon-rich broth. “Watch out,” warn the servers, “the dish is very hot!” Indeed that applies to practically every plate: sizzling wild mushrooms, herb-rubbed roasted chicken, and piping hot beets. Even desserts are a burn hazard; but in a fun, theatrical way. For the crème brulée, the server whipped out a blowtorch to caramelize the sugar before my very eyes—and wow was it good, scooped up with housemade cookies. Thus I say to you, “Allez! Allez!” Go, Go! Or more accurately, “Allez-y! Allez-y” Go ahead! Go on! Go there! The Drawback: It is packed on weekends, so make a reservation. Be careful not to burn yourself on cast-iron dishes straight out of the wood-fired oven.